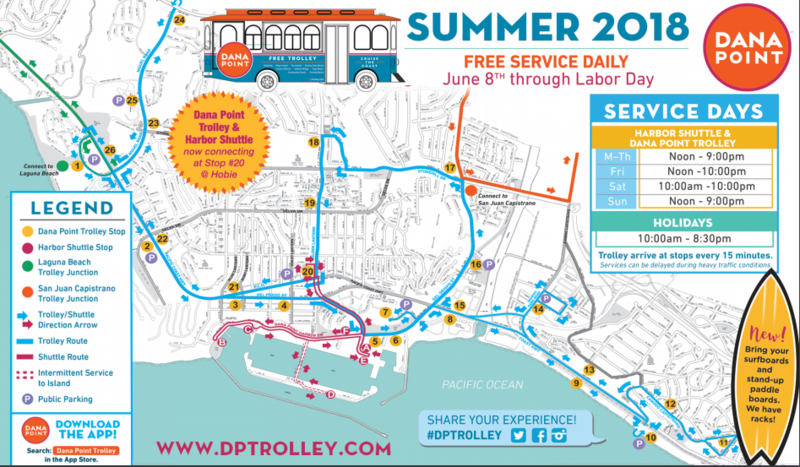 The City of Dana Point recently confirmed slight changes to the Dana Point Trolley and Harbor Shuttle routes. The changes are intended to hasten the trip for residents and visitors leaving the Dana Point Harbor to head north. As the Dana Point Harbor Shuttle exits the Dana Wharf area of the Harbor, it will now climb Golden Lantern before heading north and stopping at Hobie Surf Shop (also Dana Point Trolley stop 20.) The Harbor Shuttle will then turn around at La Plaza Park and descend west down Golden Lantern, where it will stop at new location (stop F) outside Jimmy’s Famous American Tavern. With this link, residents will no longer have to head south and circle Capistrano Beach before returning north towards stop 20. The City of Dana Point will also coordinate the times of the Harbor Shuttle and Dana Point Trolley to ease the ability of patrons to cross over.